Naamdar (dynast) versus bhagidar (beneficiary of corruption). 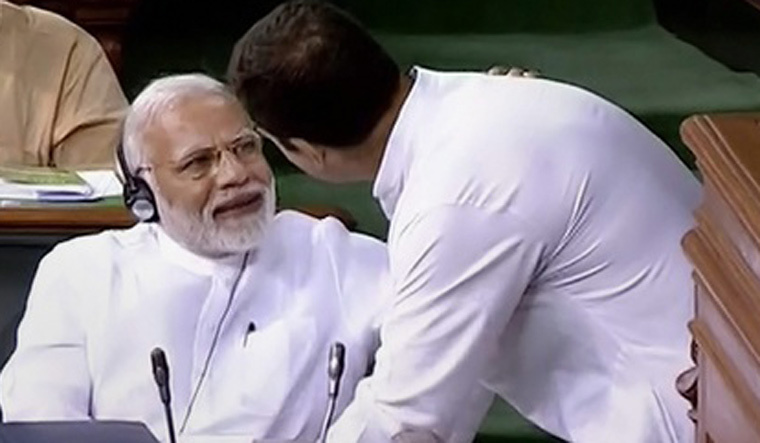 The debate on the no-confidence motion in Lok Sabha has set the tone for the upcoming election season, making it clear that the campaign narratives by the two main political protagonists—Prime Minister Narendra Modi and Congress president Rahul Gandhi—will be based on these two terms, which were the highlights of the clash between the opposition and the government. If Rahul Gandhi took PM Modi head on in the debate, terming him bhagidar, Modi made a powerful retort, calling the Congress leader naamdar, or someone who feels he is entitled to rule the country because of his family name. Rahul Gandhi, with his speech, has made it clear that the focus of his attacks in the run-up to elections will be 'Brand Modi'. If the government's efforts are to play up the idea that all its good work, especially schemes meant for the poor and the disadvantaged, is because of the initiatives of PM Modi, the Congress chief is making every effort to project the prime minister as 'anti-poor'. For good measure, in an attempt to overturn the dominant narrative, Rahul Gandhi also claimed in his speech that Modi, while oblivious to the plight of the farmers and unemployed youth, has waived loans of 20-25 richest industrialists in the country. Alleging corruption in the Rafale deal, he accused PM Modi of helping a businessman friend at the cost of the public sector Hindustan Aeronautics Limited. “The entire country has seen the truth, that you are not a chowkidar (watchman), you are a bhagidar (beneficiary),” Rahul Gandhi said in his speech. He was referring to Modi's election pledge that he would be the chowkidar of the nation and ensure that corruption does not take place on his watch. PM Modi, on the other hand, launched a scathing attack on Rahul Gandhi, saying the Congress president felt that he was entitled to occupy the prime minister's chair because he was a naamdar. The jibe was intended to drive home the idea that the Congress chief feels he has a right to rule the country as he belongs to the Gandhi family. The prime minister placed himself at the other end of the spectrum, referring to his humble beginnings, and remarked how he could not look Rahul Gandhi in the eye since the Congress leader was a naamdar, and he (Modi) belonged to a poor family. “He (Rahul Gandhi) says I cannot see eye to eye with him. Yes, I cannot do so because I am not a naamdar. I come from a poor background. I am not privileged like you,” Modi said. The naamdar vs bhagidar debate will continue.